After ten years of worshiping at the Regal Majestic, the Lord has opened up an opportunity for us to grow at Takoma Park Middle School located at 7611 Piney Branch Rd, Silver Spring, MD 20910. We are excited about all of the new ways that we can love God, love others, and make a difference in this wonderful community! Increasing our financial margin as a church, so that we are prepared for future expansion opportunities, such as a buying a building or even having an additional site. You can contribute to the All In Offering online through The City, designating the “All In Offering” fund for your gift. You may also give during the worship experience with the offering envelope, writing “All In Offering” on it. Takoma Park Middle School is a beautiful school in Silver Spring, MD. Use the map to figure out directions to the school by car, public transportation, or walking. What we've experienced can't compare to where we are going! As the Regal Majestic is converting all of their theaters into recliner seating, they are cutting their seating per theater in half and eliminating much of the open space at the front of the theater that we use for our worship experience. At the same time, we found out that a school in Silver Spring became available on Sunday mornings, which is a rare opportunity. It opened up at just the right time when the Regal Majestic could no longer meet the needs of our church. 2. When are we moving? Our first Sunday in our new location will be November 5th. 3. When and where will we have our worship experience? Our new worship experience time will be 10:30am at Takoma Park Middle School located at 7611 Piney Branch Rd, Silver Spring, MD 20910. 4. What are the benefits of us moving? We are so excited about the opportunity God has opened for The Bridge through this new location! We won't be rushed out of our venue. At the Majestic, we have approximately 45 minutes to clear the venue. At the school, the fellowship can continue, and we can host classes like Growth Rail on-site and more! We have room to fellowship! Not only will we not have to be rushed out, we'll have plenty of space for people to continue talking and building deeper relationships on Sunday morning. We have access to space for additional meetings and activities after the worship experience is over. We can now have space on-site for additional Downtown children's classrooms, space for Oxygen youth to meet, and other spiritual development classes. We get to impact the local community. Takoma Park is a great, family-friendly community. With easy access to a school facility and all the sports fields, we will have the opportunity to engage the community in new and creative ways! 5. Is there free parking? Yes! We will have a large, free parking lot right outside the main entrance! 6. How can I support our move? Join our transition team! 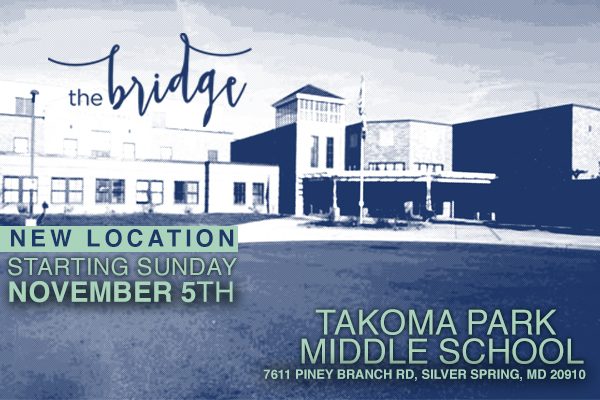 We have several opportunities for you to be ALL IN to support our move to Takoma Park Middle School. Worship Experience Teams. It's time to train more people for guest services, setup and breakdown, and the creative communications team as we will need more support at the school. Outreach. We're looking for people to help us with outreach to the Takoma Park community to let them know we are coming, like planning a special Trunk or Treat at the school or handing out flyers. Administration. Do you have the gift of administration and communication? You can help us reach out to our Bridge family by phone or email to make sure everyone knows we are moving. Transportation. Can you help meet our need for transportation, namely trucks and hitches for the day of the move and post move? Clean Up Crew. We're planning a cleanup day to clear out our theater storage and our current outside storage. Can you lend a hand? Downtown Teachers. We're asking parents and volunteers to serve in Downtown 1-3x a quarter. Downtown will be split into multiple classrooms as our families with children increase their presence on Sundays. We need everyone to be all in for training up our children. Environment & Design. Do you have a talent for creating engaging environments? Be a part of transforming the school into an environment that is inviting and warm for all who walk in our doors. Prayer Team. We need prayer warriors! Join the prayer team to cover the church during this important transition. Takoma Park Middle School is easily accessible via public transportation. The closest Metro subway station is the Silver Spring Metro Station. The Ride On 17 and Metro F4 buses are available on Sunday mornings and stop near the school. Be sure to get off the corner of Philadelphia and Chestnut. Walk northwest on Philadelphia Ave. toward Chestnut Ave. Turn right onto Piney Branch Road. We have several opportunities for you to be ALL IN by serving on a transition team. From short, one-day commitments to helping us throughout the transition, we can use your unique gifts and talents to build up God's kingdom! See FAQ #6 for the list of team.